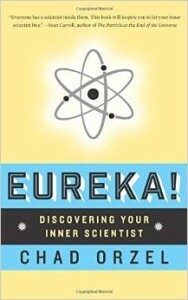 Next gift suggestion: Chad Orzel’s EUREKA! Another book that I jumped right up and ordered as soon as I knew it existed: Eureka! Discovering Your Inner Scientist, by physicist Chad Orzel. Chad has been making a name for himself lately as a science communicator, as well as being an actual working scientist. And this, by me, is good. As much as I love science, it’s through the science journalists that I find out what is going on. I haven’t yet received my copy of Eureka. I pre-ordered it so that it will pop up on my Kindle on December 9th, the instant it’s released (I’m writing this post on December 8th). But I couldn’t wait, so I went exploring through the book on Amazon, using the “Look Inside” feature. I was able to look at a lot, possibly because I was on record as having bought the book. And I found much to love. The moment that made me sit up straight and say “YES!” was when he first expresses the scientific process as taking place in four stages: looking, thinking, testing, and telling. Does this sound familiar? It should. It’s what the Steerswomen do. Chad works out those four stages in the rest of the book — and his point in Eureka! is that the scientific process is not some mysterious activity engaged in only by hyper-intelligent (and socially clumsy) braniacs. In fact, we use scientific thinking every day, and have done so ever since we were us. Here’s a video of Chad Orzel explaining what playing bridge has to do with the discovery of dark matter. And here’s a video of Chad explaining what stamp collecting has to do with Darwin and the theory of evolution through natural selection. 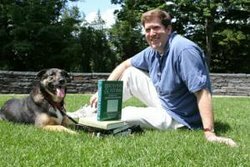 And here’s Uncertain Principles, Chad Orzel’s blog. And, oh, look: Yet another little article of mine from the misty depths of antiquity, coincidentally discussing a closely-related topic. This entry was posted on Monday, December 8th, 2014 at 11:09 pm. You can follow any responses to this entry through the RSS 2.0 feed. Both comments and pings are currently closed.